The John F. Kennedy Presidential Library and Museum, visible from Route 93 in the Dorchester section of Boston, is the only one designed and built after a president’s death. From George W. Bush, presidents have been closely involved in the design and construction of their libraries. open for another 16 years.Today, about 200,000 visitors come to the library every year to learn about the 35th president. Designed by the famed architect I.M. Pei, who then was relatively unknown, the nine-story, black and white, concrete-and-glass building sits majestically on a 9.5-acre site overlooking the entrance to Boston Harbor on what once had been a landfill. From some angles, the building resembles a sailboat, appropriate because the slain president was an avid sailor. According to the library’s website, the triangular nine-story tower houses archival, educational, and administrative functions, and a two-story base contains exhibition space and two 230-seat theaters. The 115-foot-high memorial pavilion allows visitors to look through a wall of iron-laced windows at the water and contemplate what they have seen in the museum. It is a stunning way to end your visit. 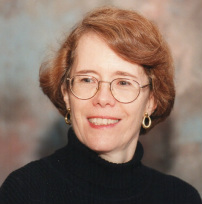 Linda Lotridge Levin, author of this series, covered the Kennedy election night countdown from Hyannis, Mass., for her university newspaper. Click here to read her first-person account. So why was construction of this museum and library delayed for more than a decade after the president selected a site? 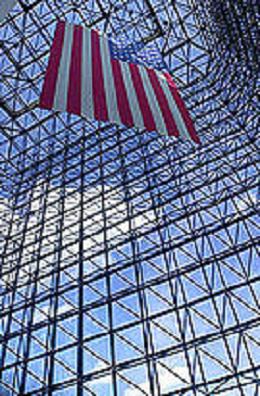 As memorials to the slain president were popping up around the world – streets, schools and other public buildings were being named or renamed for him – President Kennedy’s widow, Jackie, and members of the Kennedy family decided that his library would be the only national memorial to him, so they set up a private, nonprofit corporation that would select an architect, raise funds to build the library, and oversee its construction. Meanwhile, as his presidential papers and artifacts were stored in a federal building in nearby Waltham, Massachusetts, the U.S. Senate voted to allow the government to operate the library and museum as a part of the National Archives as it had with other presidential libraries, beginning with FDR. The Kennedy collection stored at Waltham included what might be considered an oddity for a presidential library. A serial doodler, the president was fond of sketching sailboats and anything else that popped into his mind at the moment, on menus, place cards, envelopes, and yellow legal pads. In May 1964 Mrs. Kennedy allowed them to make a wildly popular 23-city tour of the United States. Today, they reside in the president’s library and are open to scholars and anyone else interested in President Kennedy’s “creative” side. Now, with all of the materials ready to be moved into a library and museum, it was vital that work get under way. The Kennedy family and friends expected that construction would begin soon, and architects were being vetted. An oral history project with reminiscences by Jackie Kennedy, Bobby and Ted Kennedy, and other family members along with the president’s close White House associates, had begun and eventually would be placed in the library. While the federal government would operate the library, it would be built with private funds. Donations were arriving from countries, corporations, and individuals around the world. Even Fiat, the Italian car company, sent $100,000. Then the setbacks began: The two-acre plot donated by Harvard had belonged to the Massachusetts Bay Transit Authority, which dragged its feet in removing heavy equipment from the site; then the residents of Cambridge, where Harvard is located, protested the library’s presence in their community because they feared the large number of tourists it would attract; and the construction costs of the building began to skyrocket. It became apparent that if the library was to come to fruition, it needed more money and a different site. In 1976 the University of Massachusetts Boston donated a site adjacent to its campus. The view was spectacular, but the site had been a garbage dump. It soon was cleaned up, and construction began. It was completed in 1979 at a cost of $20.8 million. The official dedication was held on October 20, 1979, almost two decades after John F. Kennedy had first discussed building his presidential library. Today the library is one of Boston’s popular tourist sites. It is open seven days a week from 9 a.m. to 5 p.m. (except on Thanksgiving, Christmas, and New Year’s). Parking is on site is free, plentiful, and easily accessible to the library. If you are visiting the building, you cross a broad concrete apron or deck and go through glass doors into a high-ceilinged, sunny foyer with benches in front of tall windows where you can wait for friends or rest after your visit. The first stop is in a small theater where you will see a short movie depicting Kennedy’s childhood and young adulthood. It ends with his election to the U.S. Senate, which is fine because from the theater you head to the exhibits. Anyone younger than 65 probably has little to no memory of President Kennedy, and the exhibits prove to be a good overview of his 1960 campaign for the presidency and his less than three years in the Oval office. The exhibits are arranged chronologically and in an easy-to-follow trail around the building. You will see mementos, such as gifts to President and Mrs. Kennedy from foreign dignitaries; memorabilia of the First Lady, including dresses; an interactive display showing her work in preserving the history of the White House; and photos and letters to and from the president relating to the space race, one of his cherished projects. The nation has seen a number of attractive and influential First Ladies in the last century, but none rival Jacqueline Bouvier Kennedy. A daughter of a New York stockbroker and socialite, she spent two years at Vassar College and graduated from George Washington University in Washington, D.C.
She remained there to work as an inquiring photographer for the Washington Times-Herald. She met the future president, and after a year of dating married the handsome, wealthy Congressman John F. Kennedy. Then John Kennedy was running for president, it was Jackie whom the news media fell in love with. She was a slender, dark-haired beauty, gracious, and intelligent, and she captivated her listeners with her sweet, almost little-girl voice and her ability to make them feel as if she had eyes for no one else. It was easy to see why Congressman Kennedy fell in love with her. They were married in Newport, Rhode Island, on Sept. 12, 1953, in St. Mary’s Church before 700 guests. A reception for 1,200 followed at Hammersmith Farm, the home of her mother and stepfather. Her wedding dress is in the Kennedy Library. It is difficult today to explain how widespread Mrs. Kennedy’s popularity was as First Lady. When she and her husband made a state visit to France, she addressed the audiences in French, leaving the French besotted. Her clothing style was fashionable but understated. She could be described as the Princess Diana of her day, showing up regularly on magazine covers and as the subject of feature stories about almost everything she did. The public could not seem to get enough Jackie coverage. It should be noted here, and you won’t see anything on this in the Kennedy Library, that although her popularity peaked in the aftermath of the assassination, it declined markedly when almost five years after John Kennedy’s death, she married her longtime friend, the Greek shipping magnate Aristotle Onassis. He was divorced, not an American, and 23 years older than she was. The public felt betrayed by their princess, and the media, once captivated by her became, at times, hostile. After Mr. Onassis died in 1975, Jackie and her two children, Caroline Kennedy and John Kennedy Jr., settled in New York City, where she became a book editor. Another popular exhibit at the library is a replica of the Oval Office, complete with the rocking chair that President Kennedy preferred to sit in because of his back problems. Unlike other presidential libraries, here you will also see the office of the attorney general, who just happened to be President Kennedy’s younger and favorite brother and close friend and adviser, Robert “Bobby” Kennedy. Bobby, who had made his name as chief counsel to the U.S. Senate Select Committee on Improper Activities in the Labor and Management Field, had the President’s ear on foreign relations as well as domestic issues. As you come to the end of the exhibits, you will almost miss about all that young people today know about JFK: his assassination on November 22, 1963, while he and Jackie were visiting Dallas. Told through small black and white television screens set into the wall, the assassination is almost an anticlimax to the story of John and Jackie Kennedy. And maybe that’s how the family wanted it to be remembered, as a footnote to the presidency. Nonetheless, it is a bit disconcerting, especially to a visitor who was old enough to recall this tragic event. What is missing from this visual story of the Kennedy family and John’s presidency are the impact of his family’s wealth and influence on his campaigns, his lifelong health problems, and his excessive womanizing. Of the president’s father, Joseph Kennedy, little is said about his contacts and wealth, which proved to be an outsized influence on his son’s career, from his first campaign for Congress to his run for the White House. Joe, far more conservative than his liberal son, nonetheless was there all the way with his wallet wide open. Robert Dallek, author of An Unfinished Life, John F. Kennedy, 1917-1963, notes that Joe Kennedy financed all his son’s campaigns, including the successful 1958 run for the U.S. Senate when he spent $1.5 million. You also won’t hear a lot about the president’s health problems during your visit. According to Dallek, Kennedy suffered from colitis when he was in prep school at Choate, and his health problems continued throughout his life: ulcers, lower-back issues, urinary problems, and, most troubling, Addison’s disease, caused by the adrenal glands producing insufficient amounts of certain hormones. The treatment then, as it still is, is cortisone injections. In Kennedy’s case, the steroids weakened the bones in his back, causing him even more discomfort. The president’s medical records had recently been opened to scholars when Dallek was researching his book, and while the book is a balanced account of Kennedy’s life, the addition of this new information gives the reader a more complete picture of a man who, even if he had not been assassinated, might not have lived a very long life. The third area of JFK’s life absent from the exhibits at the library and museum is John Kennedy’s womanizing. Dallek says that by the time he was a student at Harvard, he was proving to be “a ladies man.” Throughout his adult life, often on a daily basis, Dallek writes, Kennedy required female gratification. Dallek goes into considerable detail about this, saying that, interestingly, the news media failed to report any of his sexual adventures, although by the time he got to the White House, his philandering, or as Dallek calls it, “his insatiable sexual appetite,” was well known, at least among his friends and colleagues. When you leave the exhibits, you emerge into the sun-filled, silent void of the space-framed glass pavilion. Except for an enormous American flag suspended above, the space is empty to allow the viewer to contemplate what he has seen and experienced against a great panorama of sky, land, and open sea. Kennedy was born on May 29, 1917, in Brookline, Massachusetts, a city on the western edge of Boston. His parents were Rose Fitzgerald, the beautiful daughter of John “Honey Fitz” Fitzgerald, the mayor of Boston, and Joseph Patrick Kennedy, who was a businessman. Both of John Kennedy’s parents were first-generation Irish Americans. He had an older brother, Joseph, known as Joe, and two younger brothers, Robert and Edward. Both became United States senators. His five younger sisters were Rosemary, Kathleen, Eunice, Patricia, and Jean. John attended private schools in the Boston area and then, after the family moved to New York, in the Bronx and Connecticut. For his high-school years, although he was sick from a young age, he was sent to Choate, a boarding school in Wallingford, Connecticut, where he continued to have health problems, mostly stomach and intestinal. In 1936 Kennedy began his freshman year at Harvard, his father’s alma mater. Soon after that, his father was named the United States ambassador to Great Britain. Father and son exchanged letters about the political situation in Europe, including the rise of Hitler and Nazism. John, known in the family as Jack, spent a summer touring Europe, the result being a senior thesis on the reasons Great Britain was unprepared for war with Germany. Later it was published as a book, Why England Slept. Soon after his graduation, John and his brother Joe joined the Navy, where Joe was a pilot and John was assigned to command PT-109, a small, swift vessel armed with torpedoes. It was aboard PT-109 in the South Pacific in August 1943 that John emerged a hero after the boat was rammed by a Japanese warship and broken in half. Two of his small crew were killed and he and the rest were injured. Under Kennedy’s leadership, they made it to a nearby island where, after nearly a week, they were rescued. Kennedy was awarded the Navy and Marine Corps Medal for courage and bravery. Joe Kennedy was not so fortunate. In 1944 his plane blew up in a mission over Europe. Kennedy’s younger sister Kathleen died in a plane crash in 1948, and another younger sister, Rosemary, was born with mental disabilities. When she was a teenager, her behavior changed, and in an effort to improve her condition, she underwent a prefrontal lobotomy at age 23. The results were disastrous. She became mentally incapacitated and was placed in an institution where she remained until she died in 2005 at 86. John had been particularly close to Kathleen and Rosemary. It was John’s brother Joe who was being groomed for a political life before the war, but with his death, Joseph P. Kennedy persuaded his second-born son, John, to enter politics. In 1946 Kennedy ran for Congress from Massachusetts' 11th Congressional District after James Curley vacated it to run for mayor of Boston. Kennedy was elected, and this was the beginning of his career in politics. He served three terms in the House and was elected to the Senate in 1952. The following year he and Jackie were married. Meanwhile, Kennedy continued to have back problems and other physical ailments, and underwent several surgeries. After his death it was confirmed that among other problems, he was afflicted with Addison’s disease. In addition, Jackie suffered a miscarriage in 1955 and had a stillborn daughter in 1956, and in the summer of 1963 she gave birth to a son who lived for two days. Caroline was born in 1957, and John Jr. was born in 1960. He died in 1999 in the crash of a small plane off Martha’s Vineyard. In 2013 Caroline Kennedy was appointed the United States ambassador to Japan. She is the only living member of her immediate family. John Kennedy’s presidency lasted less than three years, but during that time civil rights became a major issue; the space race between the United States and the Soviet Union as well as the Cold War heated up, and the President and his advisers sought to understand the rumblings of what became the Vietnam War. 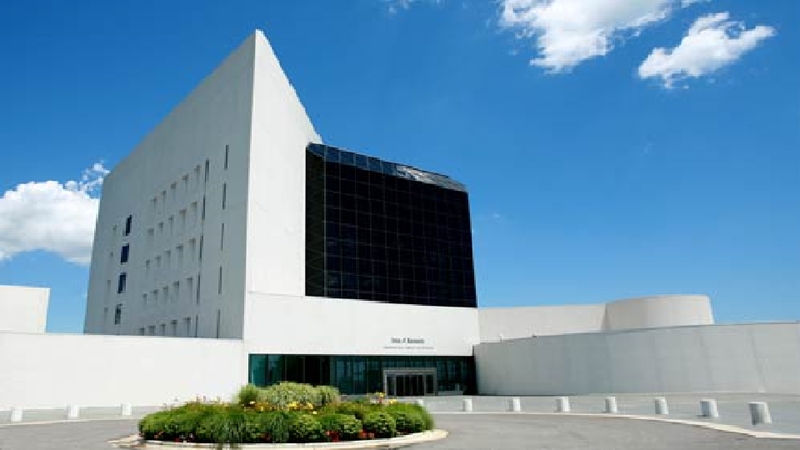 To learn more about the Kennedy presidency and related issues, you can visit the Kennedy library, located off Route 93 in Boston. Signs will guide you. The library is open seven days a week except on major holidays, from 9 a.m. to 5 p.m. Admission is $14 for adults; $12 for seniors; college students with an ID, $12, and youths from 13 to 17, $10. Children 12 and under are free. For additional biographical information about President and Mrs. Kennedy and the Kennedy clan, go to: http://www.jfklibrary.org, then go to the JFK link at the top of the homepage. Dallek, Robert, An Unfinished Life, John F. Kennedy, 1917-1963 (Boston: Little, Brown and Company, 2003. This is one of the best of the more recent biographies of the late president. White, Theodore H., The Making of the President 1960 (New York: Atheneum Publishers, 1962). White wrote the first complete account of the campaign and election. "Kennedy Library Given Papers on Hemingway,” March 31, 1964. “Kennedy’s Presidential Doodles to Tour 23 Cities,” May 19, 1964. “Fiat Gives $100,000 to Kennedy Library,” May 22, 1964. “Kennedy Library Faces Rise in Cost,” January 25, 1970. “Kennedy Library Plans Are Unveiled,” May 30, 1973. “Boston Eyes Navy Yard for Kennedy Library,” January 31, 1975.